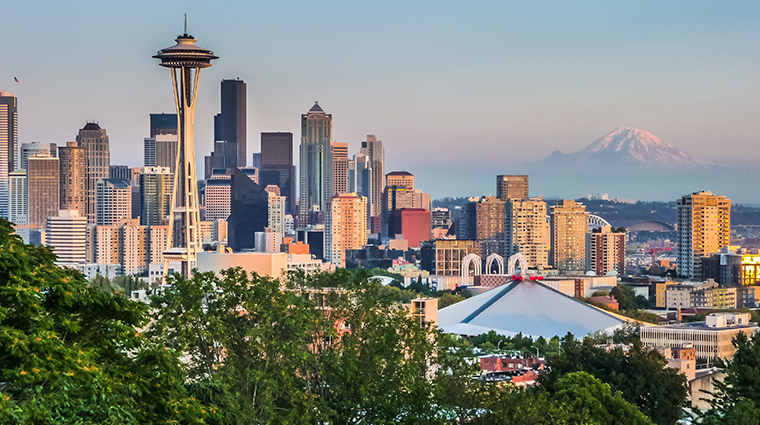 Nicknamed the Emerald City for its ubiquitous pine trees, Seattle has always been a trailblazer of when it comes to green thinking — the city boasts eco-friendly highlights like downtown electric buses, a new light rail system and an impressive number of LEED-certified buildings. But as the home base of software giant Microsoft and online mega-retailer Amazon, not to mention coffee king Starbucks, the city prides itself on innovation in business, not just the environment. The outdoors is never far from mind in Seattle — the city sits on Elliott Bay, situated between Puget Sound (an inland-probing arm of the Pacific Ocean) and Lake Washington, a 24-mile stretch of fresh water. Local chefs celebrate the Pacific Northwest’s bounty, opening hotspots that make the most of the local produce and straight-from-the-ocean seafood, often shopping for the best at Seattle’s famous Pike Place Market. First time visitors will notice that the city is built on hills — including picturesque Queen Anne Hill and eclectic Capitol Hill — but those urban slopes are dwarfed by the snow-capped Olympic Mountains to the west and the Cascades to the east, playgrounds for the city’s army of campers, climbers and hikers.